Obviously, BBC audiences cannot hope to gain “awareness and understanding of international issues” or to “remain informed about world events” (as promised on the packaging) if the BBC’s reporting systematically ignores certain aspects of the news in a particular region. It is difficult to imagine a situation in which the BBC would ignore a story about counter-terrorism forces in the UK arresting a terrorist who had shot at hikers but – having also ignored the initial shooting incident – the BBC apparently saw no reason to inform audiences that a member of the PFLP was arrested last week and admitted having carried out the attack. “The IDF and Shin Bet uncovered a terror cell operating in Hebron and Nablus, Israel Radio reported Thursday. According to the report, one of the members of the cell, which belonged to the Popular Front for the Liberation of Palestine, admitted that he had carried out a shooting attack on an Israeli vehicle near Wadi Qelt. Likewise, the BBC would most likely not elect to ignore the arrest of suspects in a shooting attack which had resulted in the death of a family member of a British government minster two years earlier – particularly if they were members of a foreign security force. And of course the seizure of a cache of illegal weapons would probably make prominent BBC headlines – especially if those arrested in connection with the incident were members of a supposedly defunct militia belonging to a member organization of a body with which the British government had signed agreements. “Israeli forces on Thursday detained three Al-Aqsa Brigades members in the northern West Bank district of Nablus as they searched for weapons, locals said. Back at the end of April the BBC tried to persuade its audiences that attacks on Israeli civilians in Judea & Samaria were “rare” – later revising the claim to “fatal attacks” after complaints from the public. The presentation of such a deliberately misleading narrative is enabled by the BBC’s systematic failure to report non-fatal violent attacks taking place in the district and related counter-terrorism activity. Not only are BBC audiences left in the dark as regards the incidents themselves, but the promotion by omission of that inaccurate and misleading narrative severely hampers their ability to understand wider issues such as the lack of progress in peace negotiations. On the night between June 27th and 28th 2013 the ‘White Night’ festival took place in Tel Aviv. This annual event – held on the last Thursday in June – commemorates the 2003 UNESCO recognition of the White City – the Bauhaus buildings in Tel Aviv – as a World Heritage Site. As readers can probably imagine, the wide range of cultural events provided a rich source of inspiration for photographers, both professional and amateur. 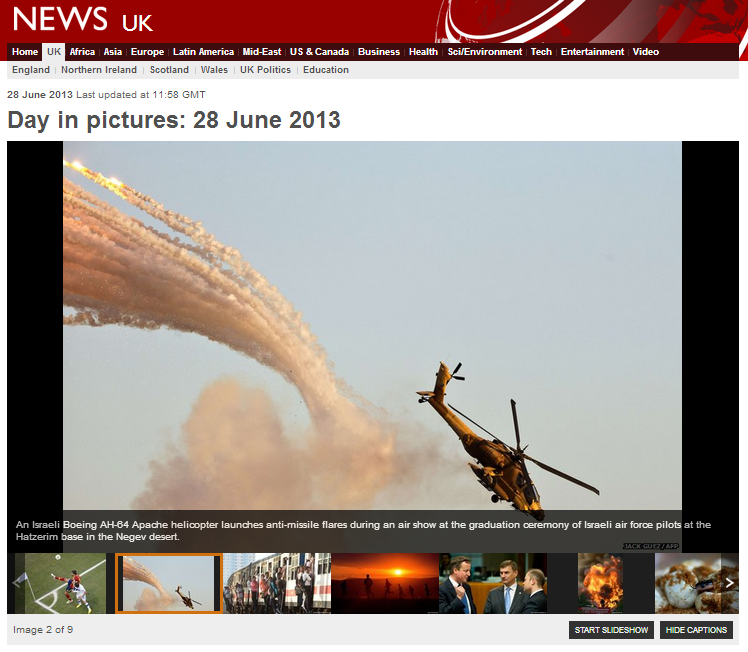 The BBC News website’s ‘Day in Pictures’ feature for June 28th 2013 included one photograph from Israel, but it was not of the White Night festival. 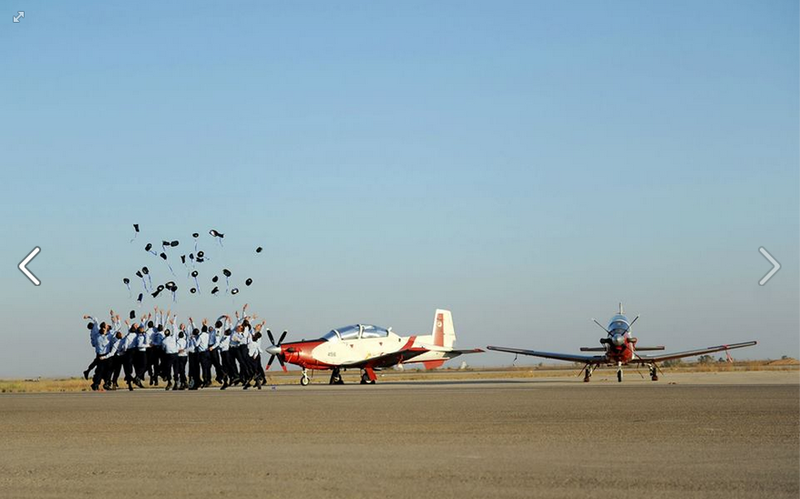 Indeed, the latest batch of Israel Air Force pilots graduated on June 28th. 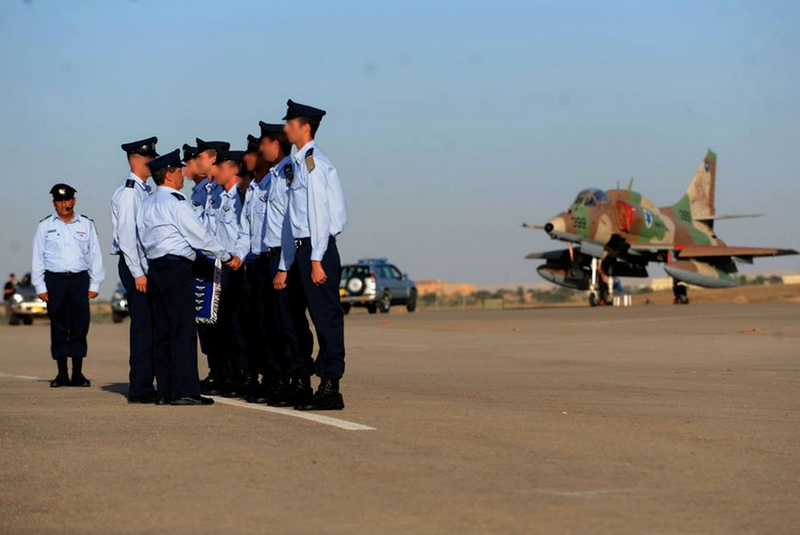 Whilst the photographic potential of that event is of course limited by the necessity to conceal the identities of the new pilots, nevertheless pictures of the people at the centre of that story do exist – as shown on the IDF’s Facebook account and among the other pictures taken by the same AFP photographer on the same day. Interesting editorial choices yet again from the BBC Picture Editor. Whether they know it or not, it seems that BBC audiences are currently undergoing a crash course on the subject of Middle East reality TV. Hot on the heels of her very extensive coverage of the ‘Arab Idol’ talent show, the BBC Jerusalem Bureau’s Yolande Knell now brings audiences news about The President. 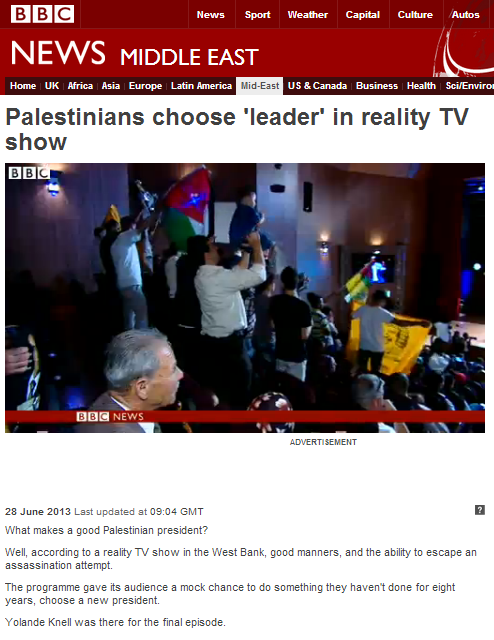 No – this is not an in-depth profile of Mahmoud Abbas, but a filmed report broadcast on BBC television news (and also featured on the Middle East page of the BBC News website) about a Palestinian reality show of that name. And whilst Knell mentions that “in twenty years, Palestinians have only ever had two presidential polls”, she does not bother to inform her audiences why that is the case. Such trite subject matter, especially when used as a vehicle for the promotion of dumbed-down context-free slogans, cannot be said to contribute to the meeting the BBC’s self-defined public purpose of enhancing ‘global outlook’. As previously mentioned, the BBC has a new style guide. In the section entitled “Israel and the Palestinians”, the entry pertaining to terrorism has not undergone any significant change. 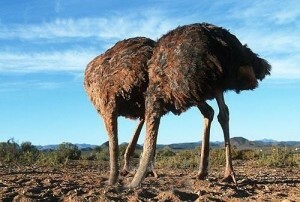 “We must report acts of terror quickly, accurately, fully and responsibly. Terrorism is a difficult and emotive subject with significant political overtones and care is required in the use of language that carries value judgements. We try to avoid the use of the term ‘terrorist’ without attribution. When we do use the term we should strive to do so with consistency in the stories we report across all our services and in a way that does not undermine our reputation for objectivity and accuracy. “The word ‘terrorist’ itself can be a barrier rather than an aid to understanding. We should convey to our audience the full consequences of the act by describing what happened. We should use words which specifically describe the perpetrator such as ‘bomber’, ‘attacker’, ‘gunman’, ‘kidnapper’, ‘insurgent’, and ‘militant’. We should not adopt other people’s language as our own; our responsibility is to remain objective and report in ways that enable our audiences to make their own assessments about who is doing what to whom. As we have noted here on several occasions, the BBC habitually employs double standards on this subject, accurately and appropriately using the term ‘terror’ and its derivatives when reporting on domestic terrorism, but scrupulously avoiding the use of the same terms in connection with widely-designated terror organisations in the Middle East. That sudden attack of ‘humility’ appears especially incongruous when coming from an organization which – as we know – pompously awards itself the status of being qualified to pass judgement on the subject of another country’s capital city. The BBC’s Beirut correspondent Jim Muir had a long article entitled “Syria sides head for neither victory nor defeat” in the ‘Features & Analysis’ section of the BBC News website’s Middle East page on June 25th. The item deals mainly with the subject of the stalemate between the various groups involved in the civil war in Syria, but Muir apparently could not manage to write about the subject without a gratuitous reference to Israel right at the end. For those unfamiliar with Muir’s “axiom” – here is the story. “In the Warring States Period the state of Han and Wei were at war and locked in a stalemate for a long time. The King of Qin was considering whether to become involved. One of his advisers told him the story of how Bian Zhuangzi killed tigers. He said, “Once, Bian Zhuangzi saw two tigers fall upon an ox. He was just about to go and try to kill them when his friend stopped him, explaining that tigers would fight over the ox; the smaller one would end up being killed, while the other would be badly wounded. If Bian Zhuangzi were to wait until them, he would take both tigers easily. Bian Zhuangzi did as he suggested. Just as expected, the smaller tiger was killed by the bigger one, which, being wounded, was killed easily by Bian Zhuangzi. So the two tigers were taken in one move. Now Han and Wei are at war. The result will be that one will be subjugated and the other weakened. If you attack then, you will gain both with one blow.” The King of Qin accepted this suggestion and gained an easy victory. This is not the first time that Muir has used an article about the conflict in Syria to promote the notion of Israel sitting gleefully on the sidelines of that conflict. As our colleague Gilead Ini noted just over a month ago, in a previous item Muir painted Israel as a cartoon villain. Mr Muir’s editors clearly need to keep an eye out for the repeated promotion of such ridiculous caricatures which not only fail to represent the serious situation on Israel’s border with Syria accurately, but deliberately mislead and misinform BBC audiences. “Israel occupied East Jerusalem in 1967. A law in 1980 formalised an administrative measure tantamount to the annexation of land taken as a result of the 1967 War. The claim to East Jerusalem is not recognised internationally. Instead, under international law, East Jerusalem is considered to be occupied territory. BBC journalists should seek out words that factually describe the reality on the ground and which are not politically loaded. Avoid saying East Jerusalem ‘is part’ of Israel or suggesting anything like it. Avoid the phrase ‘Arab East Jerusalem’, too, unless you also have space to explain that Israel has annexed the area and claims it as part of its capital (East Jerusalem is sometimes referred as Arab East Jerusalem, partly because it was under Jordanian control between 1949 and 1967). Palestinians want East Jerusalem as the capital of a future state of Palestine. 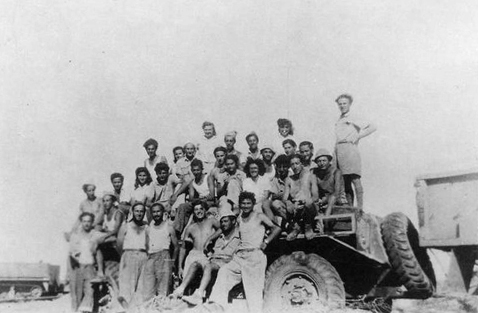 “The Gaza Strip was occupied by Israel when it captured it during the 1967 War. Under the Oslo Accords, approximately 80% of Gaza was handed over to the Palestinian Authority to administer. Its permanent status is to be determined through negotiation between Israel and the Palestinians. In 2005, Israel unilaterally completed the withdrawal of all its troops and settlers from the Gaza Strip .Israel refers to this move as ‘disengagement’ but the BBC should use the term ‘pull-out’ or ‘withdrawal’. 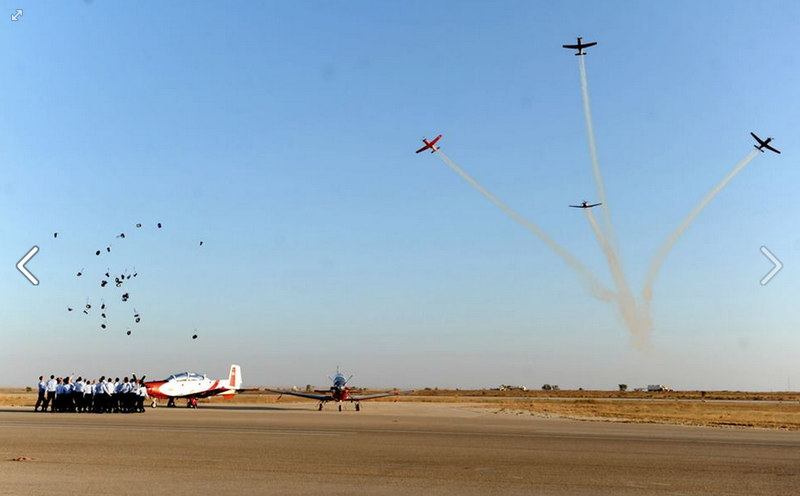 Israel retains control of the airspace, seafront and all vehicle access. All movement into and out of Gaza is controlled by the Israeli authorities, except the pedestrian-only Rafah crossing between Egypt and Gaza, which is controlled by the Egyptian authorities. Restrictions on access to Gaza were extensively tightened by Israel in June 2007, after Hamas violently forced out rival Fatah in the running of the Gaza Strip. The Israeli cabinet designated Gaza as ‘hostile territory’ and imposed economic sanctions including the restriction of movement and goods. Israel says this is in response to rockets fired from Gaza towards Israel. The restrictions came to be known as the blockade. “The status of Jerusalem is one of the most sensitive and complex issues of the entire Israeli/Palestinian conflict. Its status is dependent on a final agreement between the Israelis and Palestinians. 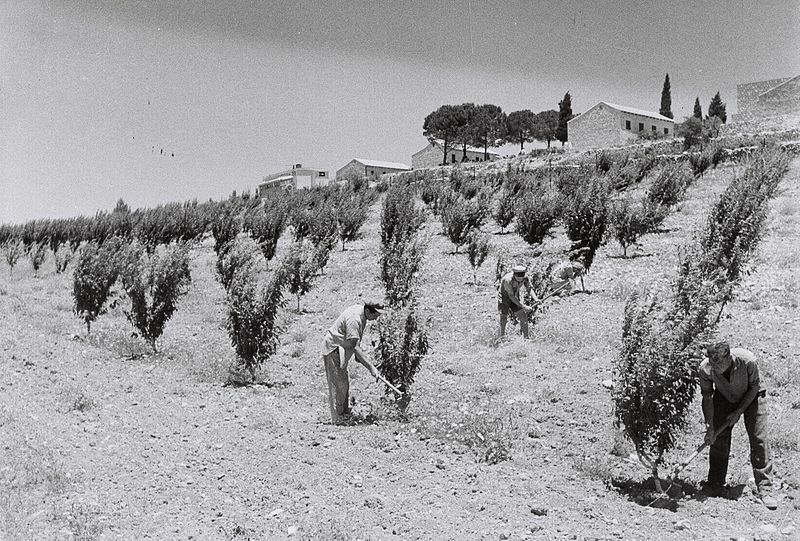 Between 1949 and 1967, the city was divided into Israeli-controlled West Jerusalem and Jordanian controlled East Jerusalem. But Israel currently claims sovereignty over the entire city, and claims it as its capital, after capturing East Jerusalem from Jordan in the 1967 War. That claim is not recognised internationally and East Jerusalem is considered to be occupied territory. Palestinians want East Jerusalem as the capital of a future state of Palestine. This is our preferred description. It is advisable to avoid trying to find another formula, although the phrase ‘occupied West Bank’ can also be used. It is, however, also advisable not to overuse the phrase within a single report in case it is seen as expressing support for one side’s view. Try not to confuse this phrase with Palestinian land or Palestinian Territories. See those entries for the reasons why. The Israeli government’s preferred phrase to describe the West Bank and Gaza Strip is ‘disputed territories’ and it is reasonable to use this when it is clear that you are referring to its position. The section entitled “Settlements” has been considerably expanded and now appears to include the old entry entitled “Settler Numbers”, which can be read here along with the old entry for “Settlements”. “The presence of settlements is one of the most contentious issues of the Israeli/Palestinian conflict and is considered a ‘final status issue’. Settlements are residential areas built by the Israeli government in the territories occupied by Israel following the June 1967 war. They are illegal under international law – that is the position of the UN Security Council. Israel rejects this assertion. When writing a story about settlements, BBC journalists can aim, where relevant, to include context to the effect that ‘all settlements in the West Bank, including East Jerusalem, are considered illegal under international law, though Israel disputes this’. It is normally best to talk about ‘Jewish settlers’ rather than ‘Israeli settlers’ – some settlers are not Israeli citizens. Settler motivations vary from financial to ideological reasons. Many Palestinians see the settlements as one of the most damaging aspects of the occupation and a way to prevent the creation of a viable future Palestinian state. There are approximately 501,856 Jewish settlers living in the West Bank: 190,425 in neighbourhoods in East Jerusalem and 311,431 in the rest of the West Bank (source: Israel Central Bureau of Statistic [sic], the Jerusalem Institute for Israel Studies, 2010). A further 20,000-odd are living in the Golan Heights. This new revised style guide provides no reason for optimism with regard to improvements in the accuracy or impartiality of BBC reporting on Israel and the Arab-Israeli conflict. As was the case with the old ‘Key Terms’ guide, it is based upon partial and politically motivated interpretations of “international law” and refuses to acknowledge the existence of any history before 1967. 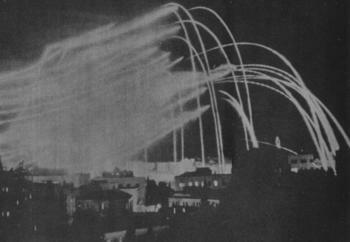 The clear adoption of a specific political narrative is shown by the use of language such as “Israel says this is in response to rockets fired from Gaza towards Israel” in the section concerning the Gaza Strip and “[t]he presence of settlements is one of the most contentious issues of the Israeli/Palestinian conflict”. The notion that “[i]t is normally best to talk about ‘Jewish settlers’ rather than ‘Israeli settlers’ – some settlers are not Israeli citizens” is bizarre and the self-appointed quasi-divine authority reflected in the sentence “The BBC does not call Jerusalem the ‘capital’ of Israel” is frankly offensive. What a wasted opportunity on the part of a corporation supposedly committed to accuracy and impartiality. 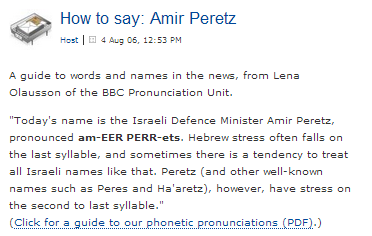 The BBC has had a special department dedicated to the subject of pronunciation in one form or other since its establishment. Indeed, Hebrew stress does often fall on the last syllable and so it has been rather surprising of late to hear (for example here from 06:16) BBC journalists referring to the Go-lan Heights rather than the Golan with a short ‘o’ and the stress on the second syllable. 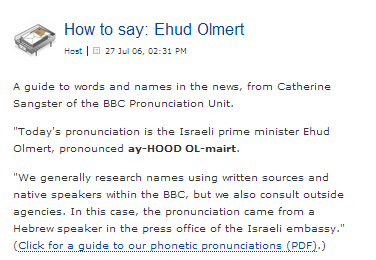 Have readers noticed any other pronunciation bugbears in BBC coverage? On June 21st 2013 the BBC News website published an article about an incident which took place at the Western Wall in Jerusalem in which a man was shot by a security guard. The article now appearing on the BBC’s website underwent some interesting changes along the way to its final version. As we see, both versions accurately described the Western Wall as “one of Judaism’s holiest sites” and “part of the retaining wall of the Temple Mount dating back to a time when a Jewish temple stood on the Mount”. Unfortunately, somebody also decided to add the anachronistic term “Wailing Wall”, which is a British invention and is not in contemporary use by those for whom the site has religious or cultural significance. In other words, the BBC’s use of the term “Wailing Wall” today is on a par with the use of outdated colonial-era names for various cities or countries in Africa or India – something which the BBC naturally refrains from doing. The next version of the article appeared some 35 minutes after that and here we find that the Arabic term ‘Haram al Sharif’ had been added to the terminology. By the time the next version came around, the anachronistic term “Wailing Wall” had fortunately disappeared. It is of course inaccurate to describe the Western Wall as “part of the Temple Mount” both in architectural and political terms. It is even more problematic when it is described as “Part of Temple Mount/Haram al-Sharif”. 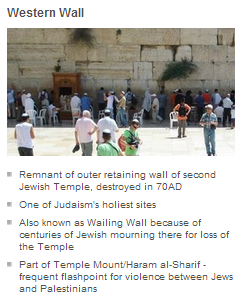 Interestingly, the earlier historically accurate statements regarding the existence of the Temple were replaced by wording relating to subjective belief rather than historic fact and the BBC apparently does not understand that the Western Wall’s significance is its status as the closest accessible place to the site of the Temple’s Holy of Holies. 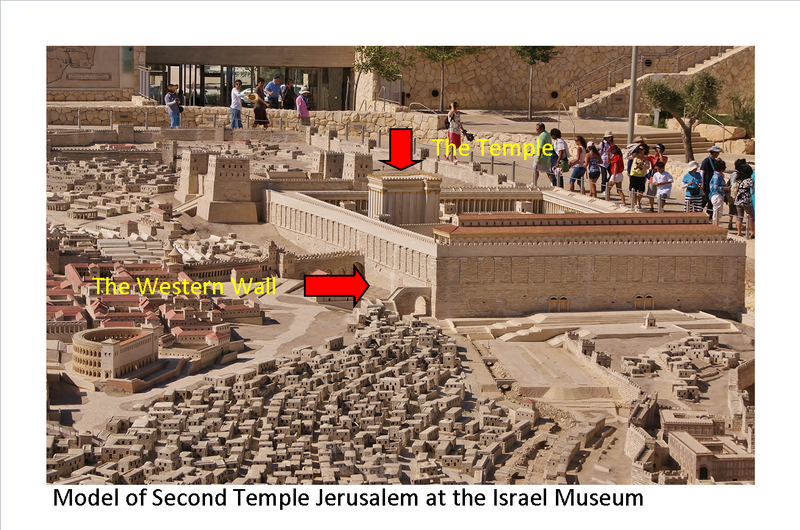 The article’s final version also includes a side box in which the anachronistic term “Wailing Wall” is reintroduced and the Western Wall is erroneously described as being a “[r]emnant of outer retaining wall of second Jewish Temple, destroyed in 70AD” – rather than a retaining wall of the mount on which the Temple stood . The use of accurate language in articles relating to the Middle East is of course highly important and perhaps nowhere more so than in the specific geographical area of Jerusalem to which this particular report relates, for reasons outlined in this backgrounder. But, as the evolutionary stages of this article indicate, the BBC seems to be unnecessarily confused about the subject – and that inevitably bewilders and misleads its audiences too. 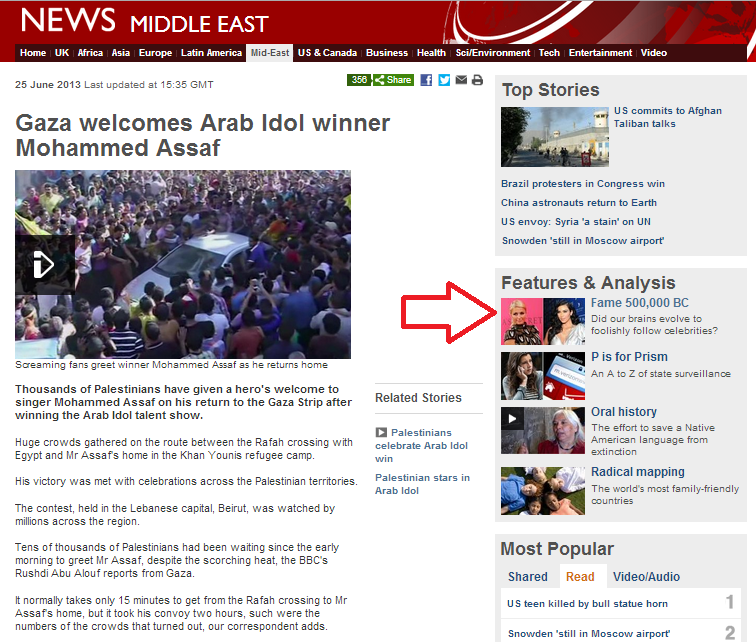 On June 25th 2013 the Middle East page of the BBC News website carried yet another item concerning the ‘Arab Idol’ winner Mohammed Assaf – a filmed report about his return to the Gaza Strip, which was also broadcast on BBC television news. Does the BBC really believe that is an accurate statement? Oh dear. That sounds more like the level of ‘analysis’ one might find in Heat magazine than that of a publicly-funded national broadcaster which pledges to “remain the standard-setter for international journalism”. But that wasn’t the end of the BBC’s ‘Arab Idol’ binge. 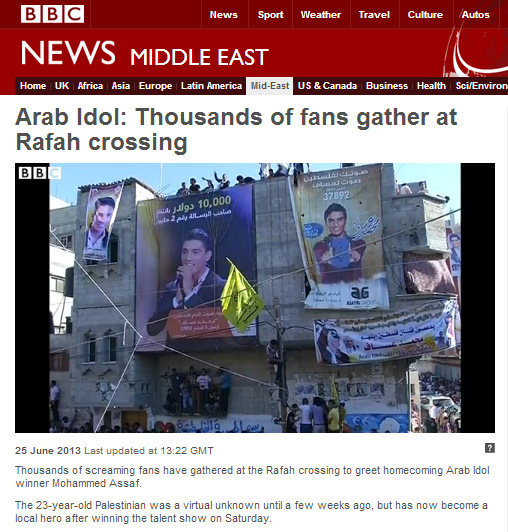 The BBC News website also published a written article on the subject of Assaf’s homecoming on the same day – the seventh item in less than two weeks. Ironically, at the same time the BBC News website also poses the obviously very pertinent question “Did our brains evolve to foolishly follow celebrities?”. 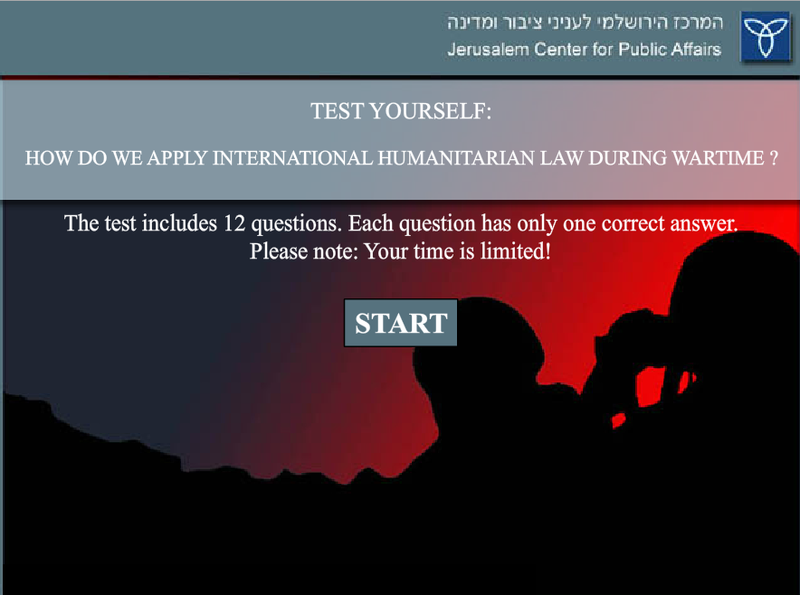 Seeing as BBC journalists are rather fond of telling their audiences what is or is not legal according to international law – at least in relation to Israel – they will surely all get top marks in this quiz on the subject of the application of international humanitarian law during wartime over on the Jerusalem Centre for Public Affairs website. 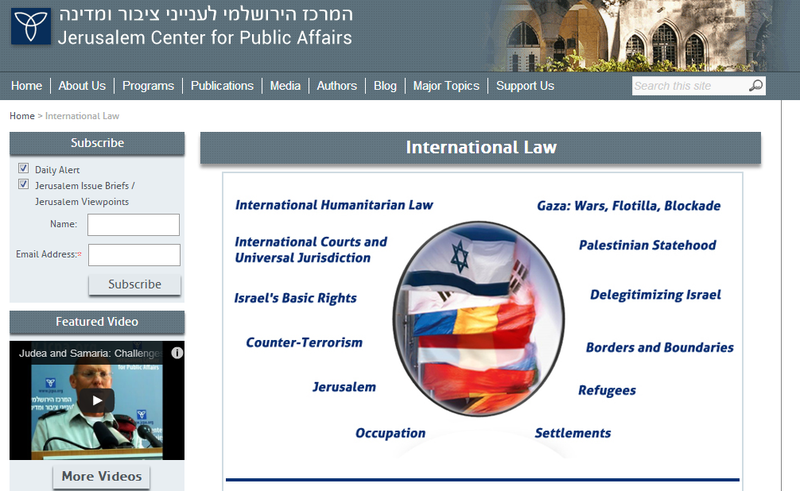 The same website has a large collection of essays on various aspects of international law which readers may find interesting and useful.